Communities are often designed without meaningful outdoor space. The development of the competition site focuses on providing outdoor play space as a shared resource for the neighborhood. Its often the case with competitions that large parts of the concept remain under-designed and such is the case with this view. A common pedestrian way would be shared and maintained by the community. 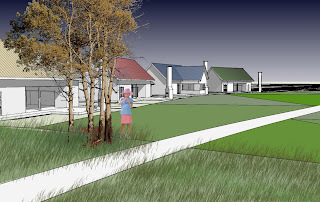 The back yard of each home would connect to shared greens, orchards and natural landscapes. These would in turn connect to pathways within the neighborhood linking homes to commercial infrastructure. The community as designed is aligned with the existing rail trail again connecting to a larger context.